This entry was posted in Stock News and Tips and tagged announced, beta, MotiveWave, platform, trading on February 27, 2019 by caustic. This is send from MotiveWave. I must say this version looks like one of the strong retail trading platforms out there. I am expecting to use this for analysis with Oanda only for now. We’re excited to announce that we’ve freshened up our look with a new logo (we like it, what do you think?) and we’ll be updating our website with new content very soon. our YouTube Channel or on the MotiveWave home page. our Download page on our website. This entry was posted in Quant Development, Stock News and Tips, Trading and tagged announced, beta, MotiveWave, platform, trading on February 27, 2019 by caustic. A new blockchain organization has been put together to standardize a new commodities trading platform. The Swiss-based venture, dubbed komgo SA, has been established by a host of international financing, trading, and production institutions that include ABN AMRO, BNP Paribas, Citi, Credit Agricole Group, Gunvor, ING, Koch Supply & Trading, Macquarie, Mercuria, MUFG Bank, Natixis, Rabobank, Shell, SGS, and Societe Generale. This entry was posted in Bitcoin Crypto Currency, Trading and tagged banks, blockchain, commodities, industry, launch, platform, trading on September 30, 2018 by caustic. This entry was posted in Bitcoin Crypto Currency, Trading and tagged banks, blockchain, commodities, industry, launch, platform, players, trading on September 30, 2018 by caustic. I am also currently deep in the weeds trying to debug a transformed algorithm routine from a very popular forex trading platform. I want this to run in Python which is for my 100% vision of using one programming language for my entire infrastructure. Another one is planned next week. Both are similar to the Head and Shoulders but more specific for Flag/Pennants and Wedges. Both indicators will be very useful to help filter out bad potential trades but more will be revealed as it gets closer to completion. More notes on my thoughts of debugging these indicators. I find this the best way to understand trading algorithms that you may use for systematic or automation. If you want to learn, get a decent debugger but I am quite surprised I have recently started using this Microsoft Visual Code for debugging. This can be the most challenging part of the whole process in automating your trades. Both IDEs (Integrated Development Environments) are free but PyCharm has bugs with no simple help. Just go with the Microsoft Visual Code Studio just for the Intellisense or debugging capabilities. I still prefer my Sublime and running the Python interpreter for quicker development. I am doing yet another demo of my new automated head and shoulders indicator. I competed this a few days ago which really pinpoint market entry and exits for cryptocurrency trading opportunities. After my last Python script I highlighted for download, this one works with Bitcoin crypto market data, I have leveraged that power for this new indicator. Do realize that this can be used for any asset class and timeframe. I will demonstrate this on Wed May 23 at 7PM Eastern Standard Time. I also plan to keep this video playback for my members only for 24 hours after the live stream is complete. As usual, I don’t need the world to know about this. More details on this automated indicator here. As the more experienced folks in my private Telegram group, someone hinted to develop the inverted automated head and shoulders for market reversals. This is even for a longing strategy like the one I plan to implement. Do note my further corrections in the link above. Did I also mention about the detailed Java based components I need to use to work with Dukascopy API and JForex for both forex and CFD instruments? That is another big step for weeks coming own the line. There you go, quite bit on the go. We are coming to the last set of people we can accommodate. This entry was posted in Bitcoin Crypto Currency, Forex, Premium Membership, Quant Analytics, Quant Development and tagged Algos, debugging, ForEx, platform, popular, thoughts, trading on May 18, 2018 by caustic. This course has 4 videos files which will introduce you to the Dukascopy API and JForex platform. It also includes an introduction to Visual JForex for non programmers. Note the advanced API required Java knowledge. Also, be aware that Dukascopy the forex broker does not take US residents as customers. NOTES: All courses include source code and source code video walkthroughs. No automatic recurring billing takes place after subscription term is completed. Prices may go up if you wish to continue. All courses included with full access to Quant Analytics. This includes courses on Python 3 Infrastructure Algo Trading, Interactive Brokers, API, with futures/options fundamental analysis. NOTE: This course has 4 videos files which will introduce you to the Dukascopy API and JForex platform. It also includes an introduction to Visual JForex for non programmers. Note the advanced API required Java knowledge. Also, be aware that Dukascopy the forex broker does not take US residents as customers. NOTES: This R course is built from an old version R 2.15. For some reason, this is still in demand but realize how old this course is. This entry was posted in Quant Development, Quant Opinion and tagged API, Courses, Dukascopy, JForex, membership, new, online, platform, services, store on April 18, 2018 by caustic. This entry was posted in Forex, Quant Development and tagged algo, API, demo, Dukascopy, ForEx, Java, JForex, platform, running, trading on October 16, 2017 by caustic. This entry was posted in Trading and tagged API, Bitcoin, Coinigy, cryptocurrency, platform, professional, trading on October 2, 2017 by caustic. Want your own Python Algo Trading Platform? 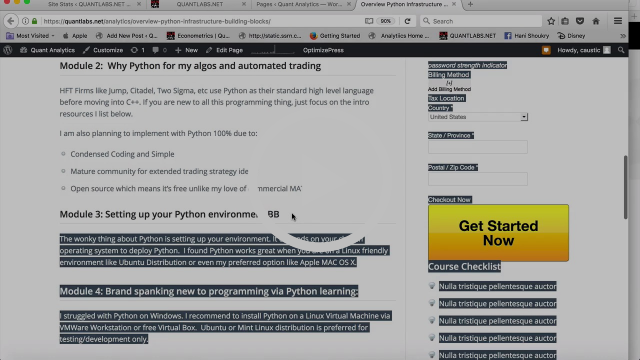 Your own Python Algo Trading Platform? Why let a quant live trading cloud solution like Quantopian disrupt your income stream? Did you know they cut off their live trading? I know they did for their Robin Hood broker connection. So what is the answer? Control your own software on your server that you can never lose. I do have a solution for you below. Did you know how big this community got? See all the icons below for all the social media links. I created a course exactly for this. You may have missed this offer so I made a video for you . You can get this course at HALF PRICE for limited time. Go here. Go questions? Let me know. This entry was posted in Premium Membership, Quant Development and tagged algo, platform, Python, trading on August 31, 2017 by caustic. 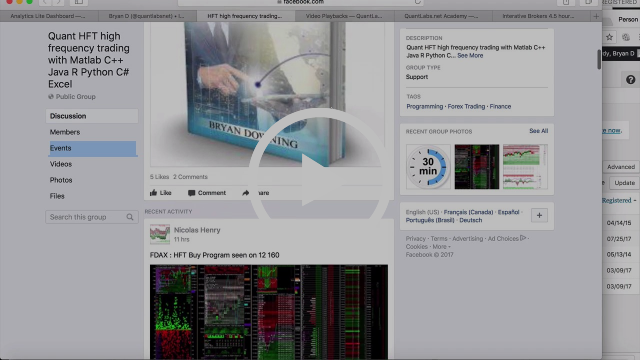 This entry was posted in Forex, HFT High Frequency Trading and tagged documentary, ForEx, HFT, platform, programming, trading on July 26, 2017 by caustic.